I saw this Business Insider story, by Kim Bhasin, on Yahoo! Finance yesterday afternoon. It seems a store in Brisbane, Australia is charging a A$5 "just looking" fee to browsers in the store; the fee is refundable, the sign promises, as a credit toward purchases actually made. The most surprising part of this story, for me at least, was that the store in question was "a specialty food store." I would have guessed an electronics store, on the order of Best Buy or H.H. Gregg. The Australian store owner is being vilified across the Intertubes these last couple of days as the above photo has seeped from Reddit into the main swirls and eddys of the Ether. I sympathize with the shop owner. Yes, it's a dumb solution -- but it's a real problem. The consumer saves a few bucks and another few of his neighbors are laid off as the big box store slides into bankruptcy. What a gimmick. Book stores and electronics stores are on life support; Amazon is thriving. Local governments are running deficits and the Never-Ending-Recession keeps going a little longer. 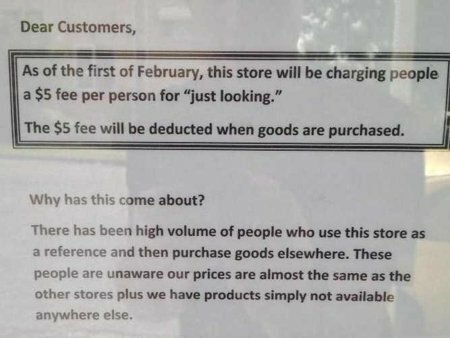 Maybe it could work in Australia -- but here in the sad old U.S.A., a "just looking" fee will never do anything but fuel the resentment of potential store customers. The competitive disadvantage in favor of Amazon and other giant online retailers can only be cured by government action: They have to be made to collect the same sales tax as brick-and-mortar stores in the area where the customer lives. If there were a Main Street Party in this country, this would be a big, big issue for them. But there isn't. There is only a Big Government Party and a Big Business Party. Birthday season -- but why? Remember when birthday parties were fun? I remember birthday parties with games involving clothespins and milk bottles -- I'd probably have to explain both to most readers -- which just means I am in that great in-between stage for birthdays. When you're young, birthdays are exciting -- the prospect of staying up later -- friends coming over -- cake and ice cream -- presents! (even if the aunts and uncles just buy dumb clothes). When you're old enough, I suppose, birthdays may become exciting again: Once you've passed the biblical three score and 10, you're arguably playing with house money. I don't know about that, not yet. Woody Allen said that 80% of life is just showing up. I'm still in the just-showing-up stage. It's vitally important to keep showing up -- consider the alternative! -- but, in and of itself, my continuing to show up is not yet cause for celebration. I think the in-between stage begins after the 21st birthday. After -- finally! -- turning 21, birthday celebrations become increasingly stressful because we begin to measure ourselves (at 25, 30, 50) against where we think we should be -- and where we thought we would be. Long Suffering Spouse and I both have birthdays coming up. It won't be a milestone for either one of us, but neither one is particularly thrilled at the prospect of being one year closer to the End than to the Beginning. And we simply aren't where we wanted to be, and we certainly aren't where we thought we would be. Three of the five kids will probably come over to the house on Easter Sunday (the oldest and the youngest are most likely unavailable), and our natal days will be observed on that occasion. Long Suffering Spouse will probably make me a cake. I hope the ants don't get to it before I do. If I do get a crack at it, I will wish for better for all of us in the year to come. I will wish for more. I will wish for the wisdom to see how to dig myself out of the financial hole in which I have buried myself. My wife will use the trick candles that don't quite go out no matter how hard I huff and puff. So it goes. So I've been blogging my brains out for 7½ years and haven't gotten so much as a sniff from a book publisher. That's nothing -- an eyeblink, really, compared to the experience of Greg Herriges and Rick Vittenson. Like a lot of Baby Boomers, Herriges and Vittenson formed a band. In fact, according to Jerry Crimmins' story for the March 21 Chicago Daily Law Bulletin (subscription required), they formed a band twice, in 1964, when they were 14 (after seeing the Beatles on The Ed Sullivan Show), and then again in 1972, when they were 22. The second time around, the north suburban duo, now billing themselves as "Athanor," recorded a few songs in Herriges' home studio. You can't fake that '70s "look"
They got a few gigs, had some publicity stills shot, even talked a couple of suburban stations into playing their songs -- they released three singles -- but, when they couldn't get that Big Break, they folded the band and went back to school. Herriges became an English professor (and published novelist) and Vittenson went to law school, eventually working 14 years for the American Bar Association. Vittenson kept his hand in the arts, performing in and contributing lyrics to the Chicago Bar Association's annual "Christmas Spirits" reviews and, as noted by ABA Journal Law News Now writer Debra Cassens Weiss in this March 18 post, playing with a band called "Malpractice," a group that included a number of ABA Journal staffers, at office parties. At one such event, according to Weiss, a colleague kidded Vittenson by saying he was a lawyer masquerading as a rock star. But Vittenson said, "No you’ve got it entirely opposite, I’m a rock star pretending to be a lawyer." Still... we all have the corpses of youthful dreams buried in us somewhere. But the shared dream of Messrs. Vittenson and Herringes wasn't completely dead -- it was just long dormant. Vittenson said "Greg got an e-mail from a fellow in France (in 2011) who said that he loved the Athanor song 'Graveyard.' He found it on a British compilation CD, a CD of different people's songs. "Greg's reaction was, 'What compilation?'" Among other bands on the compilation album were The Chartbusters, who had a hit in 1964, and The Rattles, who had a hit in 1970. "Graveyard" was a 45 rpm demo that Athanor recorded in 1973 and sent to big labels to try to get a record contract. "Somehow, one of them in pretty good condition must have made its way to this record company in England," Herriges said. Four decades later, "they snatched one of our songs" without asking. That company has disappeared, Herriges said. Yet "Somewhere There Is Music," a music blog out of France, cited "Graveyard" as the best song of 2011. "The record companies came knocking," Vittenson said. "People in Europe were talking about Athanor." And, now, just 40 years later than planned, Athanor is an overnight sensation in Europe. 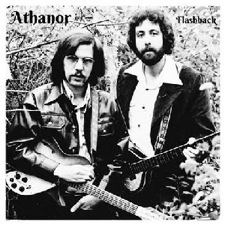 The duo found all their old tapes and picked out the best, compiling enough for an album, entitled (appropriately enough) "Flashback," released on vinyl by a Spanish label, Guerssen Records, earlier this month. It will be released in America on April 2. A CD release is also planned. "We're going to do one record release party … and that will be it," Vittenson said. "Unless somebody invites us to play in Japan." But Herriges said the band is starting to rehearse. To hear Athanor for yourself, click on the link to the ABA Journal Law News Now post; there's a YouTube video embedded. I didn't do a Frivolous Friday last week and, although no one appears to have noticed, and certainly no one complained, I kind of like it and this is my blog. This Arlo and Janis cartoon (by Jimmy Johnson) from March 14 struck me as funny... and true. The old guy I see in my pictures isn't the virile, mature man who stares back at me in the mirror. Scott Adams' Dilbert is often thought-provoking. Yesterday's episode, for example, illustrates the very problem I tried to talk about here yesterday -- doing good work isn't good enough, not unless you also Facebook / Tweet / LinkedIn / Instagram and/or Tumblr it, too. But before you accept that as the new Received Wisdom, however, note who says this is so. Or... alternatively... our unhappy barfly is in downtown Chicago. Well, I found it funny. Yes, ants. Ants are the least likeable first sign of Spring ever, especially when they take over your kitchen. The dishwasher was on last night when we fell asleep watching the TV. Younger Daughter should have run it during the day, but didn't, and, as a result, the sink was full of dishes and pots and bowls that did not fit in the dishwasher before the load was begun. When Long Suffering Spouse and I awoke, long past the end of the news, neither one of us felt like emptying the dishwasher and reloading it. This morning, I came down to the kitchen to get my wife's prune juice and turn on the coffee. First, I had to turn on a light. The kitchen counter, and the kitchen sink, were undulating. Undulating, I tell you -- no, this wasn't some sort of '60s acid flashback -- the sink and counter were alive with ants. Little, tiny brown ants like the kind that ate my dessert last year at Easter. I found the bleach spray that my wife uses in areas where food is prepared and dispatched hundreds, nay thousands, of the wee beasties, and wiped them up as best I could. I used paper towels. The kitchen sponges were bulging with ants. Ick, ick, and double ick. I still haven't seen a crocus or a rosebud, or a robin on the wing. It's still cold -- it may snow here this weekend -- but Mother Nature has decreed that Spring has sprung. Embrace it? I can barely pronounce entrepreneur, much less spell it (thank you, Spell Check). But, I'll tell you, I have to figure out a way I can attract business -- paying business. I had a bright idea recently to jump-start my moribund mediation business by offering my services to the biggest ADR provider in town -- I remembered that I had the president's email address from a file a couple of years back where I'd had to reach out to a retired judge on his panel and the company president jumped in to make certain I wasn't trying to hire his guy as a mediator 'out the back door,' as they say. Almost all of the mediators that work for this company are retired judges. And some of these retired judges are tremendous, even if I do carry a scar or two from decisions received at their hands during the course of their judicial careers. But not all the ex-judges on that firm's roster are stars. I thought there might be room for one more non-ex-judge, especially one who would be willing to work with some of these less popular ex-judges to raise their profiles... and get that company more business... by partnering with them on articles for legal or business publications. Doesn't that at least sound entrepreneurial? Well, it didn't work, but the email turning me down was at least polite. Then, this morning, I was in here writing a variation of a post I guess I've written many times -- about a professional athlete who was 'insulted' by a contract offer that would have, by itself, fixed thee or me for life. My first, and still-favorite, story along these lines predates this blog by several years. Remember the Michael Ovitz debacle back in the mid-90's? Ovitz was hired as Disney's President -- and then canned after only 16 months. He was allegedly paid tens of millions in cash and stock... just to go away. At the time, I said I could have failed for far less than that. Anyway, even as I was writing it, I realized it was a song I've sung before... and then I thought of a marketing angle I could take with the post. Right click - select all - Ctrl X, out went the post from here and over to one of my real-life blogs where I have attempted to re-purpose it as a way to attract business. This is not how I was raised. My mother used to say, "Self-praise stinks" and "don't blow your own horn." A real professional doesn't have to shill for business, business should seek out the professional on account of the professional's own skill and good reputation. My father believed that. He lived it, too: Business did beat a path to his door, even in retirement, because he was recognized as a preeminent expert in his field. If my mother's final illness, and his own, had not intervened, he could have enjoyed a very profitable 'retirement' as a professional expert witness. But, Mom and Dad, I think the world has changed. Now no one gets anything without asking for it. Maybe even begging and groveling are required. It surely can't, can't be spring. Happy First Day of Spring from frigid Chicago. The high here today is expected to reach 24° F -- half of the average high temperature for this date of 48°. It is bright and sunny here this morning -- but the Sun brings no warmth. January was too warm in these parts; we are paying the price with a very late winter. It's cold in Chicago this St. Joseph's Day, colder than historic averages, colder still when one thinks about how warm it was just last March. But this is Chicago, where the weather can be hot or cold or windy or rainy or snowy or humid or dry or chilly or warm -- and often all on the same day. So that doesn't excuse the nice man who usually sells the Sun-Times outside the train station in the mornings. This is a different nice man than the one who was there regularly for a couple of years; this is the fellow we see Sundays peddling the Sun-Times at church. I'm not singling out the Sun-Times at the expense of the Tribune. The Tribune experimented, a while back, with a tabloid commuter edition and, when that failed, it abandoned street sales entirely. Unless you take a paper at home, then, if you want a paper for the train, you're limited to the Sun-Times -- unless you consider a 'free' publication like Redeye an acceptable substitute, as only the functionally illiterate can. Of course, even the Sun-Times is a pale substitute of what it once was. Just a few years ago, for 35 cents, the paper was 100 pages thick. Then the price went up to 50 cents and the newshole shrunk and the amount of pages contracted. Then it went up again, to 75 cents, and was lucky to hit 50 pages. Michael Sneed is still in the paper, and Mark Brown, but Richard Roeper is increasingly shunted to movie review duty (Roger Ebert -- who's a marvelous writer -- must be in shaky health again, poor man). And recently the price went up to $1, just like the Tribune and, just like the Tribune, the street vendors began to disappear. Let's see: People aren't reading newspapers, so we raise prices and make our product hard to find. I begin to think that politicians have been put in charge of newspaper marketing. Not unwanted guests -- let's make that clear at the outset -- but untimely. The Curmudgeon household is more topsy-turvy than usual this morning because Older Daughter, her husband Hank, and their hyperactive golden retriever, Cork, have come to visit for the weekend. You'll glance to the top of this post now and reassure yourself that this is indeed posted on a Friday. You didn't miss a day somehow. Thus, it's not yet the weekend. It's just that Older Daughter didn't have to work this weekend and Hank could get Friday off -- but he has to be back in Indianapolis early Sunday to sing at church. He gets paid for that, you'll recall. Older Daughter would prefer to linger long into Sunday afternoon when she visits, but she'll be lucky to hold out until after the crack of dawn on Sunday. Well, sure, you say, but they could have driven up this morning. That would still leave most of today and all of tomorrow to visit. Younger Daughter and the Baby-to-be-Named-Later would be at home and Olaf will be there, too (he doesn't work on Fridays usually) until he goes to his one remaining class on Friday afternoon. And Long Suffering Spouse has a half day at school today -- it's report card day -- so she'd be home early, too, possibly with disgruntled parents waving torches and pitchforks in hot (and pointed) pursuit, but that's a different story. But Older Daughter counted up the hours 'at home' under this scenario and found them insufficient. Thus, she decided, they must come up on Thursday night. "Hank likes to drive at night," she insisted (and perhaps he does, too). But we don't want you on Thursday night, I wanted to scream, but did not. I tried reason instead: We have to work Friday. "Oh, you needn't worry about us," Older Daughter said, "we'll let ourselves in whenever we get there." And, in the event, they did. Long Suffering Spouse and I hadn't yet made it upstairs. We'd fallen asleep in our chairs watching the news -- after trying, as much as we could, to quickly put all the breakables above the dog's lethal tail level. In fact, that's what brought me back to semi-consciousness somewhere around 11:30; I heard Long Suffering Spouse say something like, "There's the dog," and the next thing I knew an 80-pound lap dog was leaping on top of me, licking my face. His aim was unerring; it's a good thing I've had my children. We made nice with the kids for a few minutes while the dog tried to run off the lethargy of a three hour car ride (Hank drives pretty fast; most people would need more like four hours to cover the same ground), and then Long Suffering Spouse and I said we'd be going to bed. Hank still hadn't brought in Cork's cage -- the dog spends his nights in our house in a giant cage that takes up a good portion of the new den; we had to move the baby's high chair to make room -- so Cork followed us to the stairs. "Go back, dog," we urged him. "Cork, come here!" ordered Older Daughter. My wife and I started up the stairs. The dog pushed in front of us. He's an amazing sight on the wood stairs. He seems to fall up. It sounds like he's falling, anyway. Cork pushed his way into Younger Daughter's room and began washing her face with his tongue. Not surprisingly, this woke her up. A little. "Dog?" she said, more or less, and, after some more licking, she sat up in self-defense. "Do you want me to take him downstairs?" she asked. But Cork had charged out of Younger Daughter's room and into mine. "Yes, I see you," said Long Suffering Spouse, "but I'm going to sleep. Why don't you go to sleep, too?" "Cork!" called Hank, still in the den. "Cork, come here!" ordered Older Daughter. I think she'd made it to the bottom of the stairs at this point. Oddly enough, I think Hank and Older Daughter were both tired, too. Cork decided at this point that Long Suffering Spouse was not going to present her face for washing, so he dashed back into Younger Daughter's room. I quickly closed and barricaded the door. Within a few minutes I heard that terrible scrambling, crashing noise that meant that Cork was heading back down the stairs. Within a few seconds thereafter I was asleep. Still, the baby was awake early today -- but even with Olaf, Younger Daughter and the baby all downstairs, Long Suffering Spouse and I were almost out the door this morning more or less on time. And this was with letting the dog out to do what dogs must do and getting him fed. I had my coat on and Long Suffering Spouse was just about finished gathering up her stuff -- the car had already been warmed up in the driveway -- and Older Daughter started down the stairs. "Are you leaving already?" She sounded disappointed -- and surprised. "We were supposed to leave 10 minutes ago," I said. But still there had to be more greetings and leave-takings. Even so, I don't think Long Suffering Spouse was more than 10 minutes late. In the confusion she did forget something she needed first thing, so we had to go back and get it. Usually, when one has visitors one has the privilege of setting a time for their arrival. "Come at 5:00," we might say, or, "Come after dinner." There are two classes of visitors, however, who can set their own arrival times, our own schedules be damned, namely, immediate family and police officers executing search warrants. I'll leave it to you to decide which is more disruptive; right now, I'm too tired. I happened to be online yesterday when white smoke was first observed coming from the Sistine Chapel chimney. I quickly logged onto the website for the all-news radio station here (you can't get AM reception otherwise in downtown Chicago) and then Yahoo! posted the ABC News TV feed. I watched and listened. It was a nice touch when the new Pope asked for prayers from the assembled crowd before offering his own blessing. And the Vatican is insisting that the Pope, a Jesuit, took his name from St. Francis of Assisi, not St. Francis Xavier (the Jesuit missionary). But at least the new Pope's status as an S.J. explains why he could be selected at the age of 76. Even though he allegedly was a strong candidate at the last conclave, Jorge Mario Bergoglio was not on the short lists of either the experts or the bookies this time because of his age. The Cardinals, it was felt, would be looking for a younger man. Of course, for a Jesuit 76 is practically youthful. Bergoglio's selection was also seen as a surprise by those who assumed that the Italian Cardinals (still the largest single group in the Church) would want to recapture the papacy. But, though born in Argentina, Jorge Mario Bergoglio (like so many other Argentinians) is the son of Italian immigrants. I think the Italian Cardinals pretty much won. I hope the entire Church comes out a winner, too. The initial coverage is very favorable, of course, but it is for every new Pope. The Pope is the focal point of a great many conflicting hopes and the grumbling will begin sooner or later. Pope Francis might as well go for sooner: If the Church wants to presume to instruct the world (much less the faithful) on matters of morality and conscience, it has to confront its own history of child abuse. It must extirpate those who have committed these crimes, regardless of rank, and openly punish those who have concealed, covered-up, or otherwise tried to evade the question of the Church's responsibility. Pope Francis should pledge cooperation with civil authorities for the protection of children. Abusers should be laicized and jailed -- unless, of course, the passage of time has made criminal prosecutions impossible. In that case, the abusers should be retired to a locked-down facility administered by the Church (these do exist). Any superior of an abusing priest or nun found to have shielded an abuser from prosecution should likewise be subject to prosecution or, if the passage of time has made that impossible, obliged to confess their misdeeds publicly and, in the appropriate cases, being forcibly retired to a life of contemplation -- and penance. We will never rid the Church of persons who would exploit children. We can't get them entirely out of the Boy Scouts or Girl Scouts or out of sports programs or public school classrooms either. The abuse of children is not just a Roman Catholic problem; wherever there are children there will be those lurking nearby who harbor an unnatural attraction to children. But we Catholics can take the lead in honestly dealing with the problem. We can confront our ugly past and regain our future. And the abusers? There aren't as many as the lurid accounts in TV and newspapers would make you think. We can keep our kids safe if we exercise a little vigilance and common sense. You don't have to call the cops because a priest hugs a child. But no one -- no priest, no teacher, no coach -- needs to be alone with your kid. Ever. Anyone who tries to get your kid alone is someone who should never, ever be permitted to do so. Francis, tell the world this, and mean it. And follow up. The screaming will be loud, and sorely overdue, but if you insist on claiming a tie to Francis of Assisi, remember what he heard in a vision back in 1205, "Francis, Francis, go and repair My house which, as you can see, is falling into ruins." Fix our house, Francis. I heard a Charles Osgood segment on the radio yesterday morning in which Francis Cardinal George of Chicago and Evanston's own Garry Wills, professor, author, and former seminarian, were both interviewed on the subject of priestly celibacy. Mr. Wills and Cardinal George are both brilliant, whip-smart men and I could only hope they might someday condescend to converse with a middlebrow like me. But they probably shouldn't be invited to the same party. Cardinal George defended celibacy by saying it is a sign of total commitment -- give all that you have and follow Me -- or, as Matthew put it (10:29-30), "[T]here is no one who has given up house or brothers or sisters or mother or father or children or lands for my sake and for the sake of the gospel who will not receive a hundred times more now in this present age: houses and brothers and sisters and mothers and children and lands, with persecutions, and eternal life in the age to come." The priest is supposed to put his vocation ahead of everything -- family, friends, possessions -- and celibacy is a sign of this. Mr. Wills scoffed. If this were so, he argued, why would anyone go to a married doctor? He or she is not fully committed to the profession. Why would anyone allow their children to be instructed by a married teacher? He or she is not fully committed either. With all due respect to Cardinal George, Mr. Wills gets the best of this exchange. We all know the Church imposed celibacy on the priesthood in the Middle Ages, as much to preserve Church property as for any other reason. Down through the ages, celibacy has been winked at, if not outright ignored, by many priests, bishops and (yes) even a few Popes. And a public vow of celibacy provides some cover for child predators who have disguised themselves as priests. On the other hand, allowing priests to marry would be no guarantee of child protection: Jerry Sandusky was married, for example. But I would not be too quick to encourage a relaxation of the rules against allowing priests to marry. The parish priest has too much to do to have a healthy family besides. Sure, he can make many of his sick calls during the day, and some meetings can be scheduled during the business day. But most of his work is of necessity done at night, when the laity are home from work and can attend board and committee meetings that keep the community going. Instead of helping his own Timmy with his homework, Father would have to meet with the parish school board and discuss the revisions to the math curriculum. Tomorrow it's the Bible study group. The Parish Council needs to talk about the budget again. The next day the Holy Name Society meets. And Father would be well-advised to make an appearance at the girls' volleyball tournament and the boys' basketball game. There's a wedding rehearsal on Friday. And the phone will ring at the oddest hours, because Death and Sickness keep their own schedules. There are Sunday's homilies to plan, and homilies for the upcoming weddings and funerals, and he still has to say Mass daily, usually more than once a day. Maybe he can even find a little time to pray. Of course, the solution to this crushing workload is to divide it up among many priests -- but vocations are few. I can't deny the possibility -- but marriage takes time and effort -- and even if the workload were more equitably distributed there would still be calls at odd hours and meetings. Some married clergy would succeed and some would, inevitably, fail. In a church that does not permit divorce, what do we do when the marriage between Father and Mrs. Smith breaks down irretrievably? And, you know what...? Those pesky property problems that motivated the Popes in the Middle Ages would rear their ugly heads again: The parish church might not be left to be divided between Father Sam's son and daughter, but a wage would have to be paid that allows Father to support his family (and could we pay enough for him to afford Catholic schools?) and there would be retirement and insurance expenses. If the new Pope were to call me for advice, I do have something to suggest. If we're still waiting for white smoke tomorrow, perhaps we can talk about it then. The College of Cardinals, at least those 80 and under, are locked in the Sistine Chapel at this hour, praying and politicking over who will be the next leader of the world's 1.2 billion Catholics. But it's not really important. I am, as many of you know, a church-going Catholic (whether I am a good Catholic is not for me to say). The religious order that served my home parish for over a century recently decided it could no longer staff our church, so we are about to get a new pastor assigned by the Archdiocese of Chicago. From my perspective, that's far, far more important than who will become the next Prisoner of the Curia in Rome. I'll have to deal with the new pastor; at least, I'll have to sit through his sermons. Or, if things go really badly, I'll have to start looking around for a new parish. The fella in the white cassock in Rome is not going to change things that much. The Catholic Church doesn't work that way. Glaciers zoom by comparison with Mother Church. The church will have rules requiring priestly celibacy for the foreseeable future; maybe they will be observed and enforced with greater rigor. The church will not suddenly ordain women as priests. The church will not change its teachings on abortion or birth control. Even if the new Pope is determined to make great changes, he will find he must move slowly... incrementally. But the new man in our rectory is a long way from Rome. I hope he will be celibate -- but some priests are not. Some have girlfriends (or boyfriends) and some flaunt them. I hope our new pastor will be a good role model for children -- but some priests are predators. I hope he will be an honest, capable administrator -- but some priests steal with both fists. Others are such naifs that people around them can steal with both fists. I hope he will be open to the parishioners' ideas about how things should be run -- but some priests are pig-headed dolts who hear no one but themselves and do whatever they damn well please. It is already rumored that our six weekend Masses will be reduced to three or four at most. Our three weekday Masses will be cut to one or two. We will have only one priest, not two (only a few years ago we had three) and he won't be able to keep up the Mass schedule and do all the other things that must be done. How he does whatever he can do will have much more influence and impact on my life than anything that comes out of Rome. We had a meeting in the parish a few months back where we could give some feedback to the archdiocesan authorities about what we'd like to see in a new pastor (unlike many Protestant churches, we do not choose our priests; they are assigned to us and we make the best of it). The good fathers who came to the very well-attended meeting were not surprised to hear the concerns we raised. "Basically," one of the priests told me after, "your parish wants Jesus Christ with an MBA. Well, guess what? We all want that." I heard that same job description used in connection with what Catholics want in a new Pope, too. So I'll tell you what: We'll let Jesus Christ with an MBA be the next Pope. For our new pastor, we'll settle for Bing Crosby in Going My Way. Daylight Savings Time was supposed to save energy -- and it would, too, if we didn't spring ahead so darn early. It was just starting to be light out when we began our day at the Curmudgeon home last week. In another couple of weeks, but for the time change, we'd not need lights at all in the morning. But today, after the time change, it was full dark when the alarm clock called us back to consciousness. Everyone likes the time change in the fall -- that one happy weekend is an hour longer -- but it is so much harder to lose an hour. Long Suffering Spouse particularly hates this time change -- and she let me know all about it, in no uncertain terms, both last night and this morning. Thus inspired, I've been trying to come up with a way to make this time change a little less awful. As usual, the comics have pointed the way for me. Perhaps you saw Tim Rickard's Brewster Rockit: Space Guy yesterday? Brewster got me thinking. Why does the lost hour have to be sliced out of the middle of the night? Adding an extra hour to Saturday night makes sense in the fall, but taking one out in the spring... well, let's put it this way: I need all the beauty sleep I can get. Surely we could pick a better hour to lose than that. So here's my modest proposal: Next year, let's start DST a few weeks later -- so we recapture the potential for energy savings -- and instead of having the clock go from 1:59 am to 3:00 am on Sunday morning, why not have the clocks jump from 1:59 pm to 3:00 pm on Friday afternoon. Same lost hour -- but an entirely different attitude, don't you think? Yesterday's close encounter with a virus-laden email (that was sent from one of my own email addresses to another of mine) reminded me of something else I wanted to get off my chest. Stop asking me for my mobile (cell phone) number. You're not getting it. You're never getting it. You're not really asking for it for my "security." You want to use it. Sell it. And I don't want to hear from you -- or any of your "partners." Besides, even if I voluntarily gave it to you and the pack of wolves you want to "share" my information with, I'd likely be giving it Eastern European hackers, too. Especially on Yahoo! And that goes double for you banks who keep asking. Haven't you taken enough from us? Do you have to sell our cell phone numbers too? Chase is particularly awful on this. Try and pay your card on line sometime: They won't let you unless you give them a phone number to send a "security code" to. Security code my Aunt Martha's false teeth. I've said it before and I'll say it again: I don't want security preventing someone from paying my bills. If some idiot hacker wants to pay down my credit card balance, he or she is at complete liberty to do so. Yahoo! CEO Marissa Mayer wants all her employees to come into the office -- no more working from home. And it's no wonder: Yahoo! email is increasingly insecure. I have a Yahoo! email address for this blog... and everyone in my address book got spammed this afternoon. I use another Yahoo! email address for my public blogs... and everyone in that address book got spammed a few months back. And it seems hardly a week goes by without my receiving at least a couple spam Yahoo! emails -- a single line live link with no subject line but from a real, known person so it gets by most spam filters. Click on the link and you give the spammers access to your address book -- and somehow that includes passwords, too. I've just changed all my passwords... again. Ms. Mayer and her newly reunited office mates really need to look into why Yahoo! email is particularly vulnerable. She needs to make this a priority. 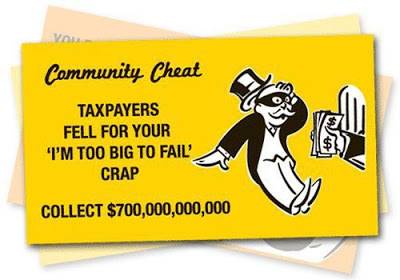 Supposedly from a game called "Kleptocracy," posted on Facebook by The Other 98%. If the game really exists, I'd sure like to see it. And here's a likely use for all the optimistic headlines about surging stock prices and so forth. Clay Bennett cartoon, originally from the Chattanooga Times Free Press. I know, I know, class warfare is supposed to be the exclusive domain of the wild-eyed leftists. But sometimes... just sometimes... I think it must be the next "Good War." Dilbert cartoon, by Scott Adams, from March 4, 2013. Obtained from Yahoo! Comics. But, OK, you say, enough. 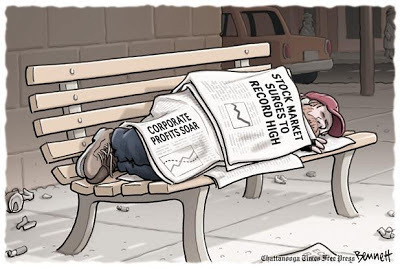 We are reminded often enough of how desperately we are clinging to the underside of the middle class. Even if these examples are humorous, you say, is there nothing else that you found amusing this week and care to share? Well, today's Pearls Before Swine, by Stephan Pastis, is pretty amusing, in a too-close-to-home way. We've all done it. When Muffy or Buffy gets an 'A' we're happy; when the kid brings home a 'C' or (heaven forfend) a grade lower than that, we go ballistic. The kid gets ice cream and TV and Internet privileges with a good report card; we start taking things away when the report card disappoints. When the kid does well we don't bother the teachers or the principal. And when the kid doesn't perform to expectations, we start calling and emailing -- and complaining. There are teachers out there, Moms and Dads, who will give your kids an 'A' or a 'B' just to keep you off their backs. It doesn't matter that your kid hasn't learned anything. In some cases, it doesn't matter that the teacher hasn't taught your kid anything, or even tried to. You're happy with the good report card; the kid is happy, blissfully unaware that his future is at risk; the teacher is free to surf the Internet during class time. I've invented a composite teacher to illustrate. Priscilla Pigdahl is not a real person, but let us say I've seen persons like her. The Priscilla Pigdahls of the world are usually long established at their schools. Eighteen years ago, my imaginary Priscilla Pigdahl was eased out of teaching math in the junior high because test scores had dropped so low and parents -- already paying tuition -- were hiring tutors to help their kids meet the entrance requirements for the good high schools. An algebra teacher was hired, and test scores in math perked right up, mainly because Priscilla Pigdahl was shunted into teaching Social Studies. But other teachers come and go; Priscilla Pigdahl remains. She wound up teaching math to sixth and seventh graders again. The eighth grade math teacher, who was supposed to be teaching algebra, found herself trying to teach all the concepts that the kids had missed in Ms. Pigdahl's classes. The other teachers got used to the frequent PA announcements telling Ms. Pigdahl's students to bring crayons to math class. Only the ones who had kids in the school really cringed; the rest were too busy with their own classes -- and no one would take on Ms. Pigdahl. She might eat them. In her Social Studies classes, the kids watched a lot of movies. They did a "unit" on the Titanic -- which absorbed a good month with movies. For their study of the Civil War, they watched Glory. But the kids got 'A's and 'B's and most parents were happy. I can imagine one otherwise sensible parent writing a note -- that Ms. Pigdahl proudly showed to everyone in the building -- praising her as the "best teacher" this parent's son ever had... mainly because he got 'A's in her classes -- and nowhere else. Ever. I can imagine someone very much like my Long Suffering Spouse telling me this story with equal parts frustration and anger and tears in her eyes; I can imagine her never quite speaking to that parent the same way after this. But, wouldn't you know, test scores began to slip again as when Ms. Pigdahl returned to 'teaching' math. Since problems became painfully evident on high school entrance exams, the 8th grade teacher was unfairly blamed by some concerned parents. Parents like good report cards, but they expect test scores to be consistent with the report cards. I can imagine my Long Suffering Spouse telling me how, a few years back, Priscilla Pigdahl went to the 8th grade teacher to ask for some help on some of the concepts she was supposed to be teaching. The 8th grade teacher had to teach Ms. Pigdahl. Ms. Pigdahl wasn't afraid that word would get back to the principal; she was secure in the knowledge that the principal would back her up -- after all, parents loved Ms. Pigdahl. And it takes a big woman to ask for help. Besides, she eventually found a different way out. All schools these days have standardized tests. Properly administered, these can provide some valuable insight into how well the kids are doing, how well the school is executing its mission, and how well the individual teachers are communicating the curriculum. But some students don't test well -- and, to make up for this, at some schools "practice tests" are administered before the real things. Get the kids used to the process and they'll perform at their best when the time comes to sit for the real thing. A lot of the test providers create practice tests for this very purpose. They send them to subscribing schools along with the real tests. I can imagine Priscilla Pigdahl's school giving both the practice and real tests to the teachers at the same time. That's when Priscilla Pigdahl started "teaching the test." The kids learned the problems and the answers to the problems -- the real questions, from the real test, during regular classtime -- maybe a few of them picked up how to do problems like these in the process, but that wasn't Ms. Pigdahl's goal. Her goal was to stabilize the declining test scores... and in this she seems to have succeeded. No, no one complains about Ms. Pigdahl -- but, within a few years, so many parents complain about how the high schools "don't teach" and are "so hard" and how their kids get shunted into average or even dummy classes. They blame the high school teachers for not passing the kids through like Priscilla Pigdahl. The funny thing is, in this modern day and age, parents have more access to what their kids are doing in school than ever before. So many schools require their teachers to have their gradebooks online -- so parents can look in at anytime and see how Junior is faring. The Priscilla Pigdahls of the world are easy enough to spot if parents would only use these resources: Ms. Pigdahl has 10 grades in a grading period; the real teachers have 40 or 50. Real teachers give homework, and grade it. If Priscilla Pigdahl gives homework, she merely 'checks it off' if it is turned in. Anything can be written on the paper -- gibberish or doodles will suffice if no one ever looks the paper over. Some schools require their teachers to post lesson plans online, too. You can ask your kid at dinner whether teacher covered x, y, and z in class like he or she said on line -- and if the kid says, no, they colored butterflies instead to decorate the room for the Spring Open House, you are on notice that you may have a Priscilla Pigdahl in your school. Does your kid get make-up tests on a regular basis? Now, there are times when students will not grasp new material and the teacher winds up sorely disappointed by a uniformly poor performance on a test of this material. A review follows and, sometimes, kids are given the opportunity for redemption with a make-up test. But does this happen all the time? Are the questions on the make-up test the same questions as on the original test? How many make-up tests can a kid take? One and done? Or as many as it takes to get that unearned 'A'? There's an old saying that one should never question good news; there'll be bad news soon enough. But sometimes the good news is bad news -- and it only gets worse if you ignore it. 'A's don't guarantee success in life, especially if they're given just to keep you off the teacher's back. But you can pay attention; please do. I wrote last month about our electrical problems at the Curmudgeon estate. Nearly all of the second floor suddenly lost power; we couldn't reset the circuit breaker. We could hear the short circuit 'popping' in the wall. We had the electrician in to try and remedy the problem, and he jiggled the wires for a while, trying to trace back the fault. Suddenly the power went on again but without, and the electrician would be the first to confirm this, him doing anything that he could identify as a repair of the problem. He told us straight out it wouldn't last; he was hoping, he said at the time, to get safely back to his truck before it went out again. Well, it lasted a little longer than that. The "fix" lasted nearly four weeks, in fact, until Saturday afternoon. Oh, it was an eventful weekend at the Curmudgeon home. Olaf brought the baby downstairs on Saturday morning. He started by walking down the stairs. Unfortunately, he was paying too much attention to the baby and not enough to his own feet. He finished by sliding down on his back. The good news was he didn't drop the baby. But the noise made by the impact, and then his shout, and then the baby screaming... well, my nerves were shot. I didn't think I could get jumpier. And then the power went out. Ours is now something of a split-level home, conventional on the bottom, Amish on top. The electrician (with whom I'd spoken recently to tentatively schedule the rewiring of the second floor for the week of March 11) has agreed to try and move us up on the schedule -- but we'll probably be showering in the dark most of the week. It will be especially challenging to shave. Oh, and guess what? We're supposed to get another six to 10 inches of snow in Chicago tomorrow. By Sunday morning, Olaf was moving so gingerly that we finally persuaded him to see a doctor. X-rays were taken. He did rupture a disk; he does not appear to have bruised a kidney. But the bruise is so deep and so painful that the doctor prescribed a pretty high dose of Norco -- and the opiates seemed to do little good yesterday. The good news is that Olaf made it to work this morning. The bad news is, despite our suggestions, he was not driven there by Younger Daughter. Younger Daughter was awake in time, and willing to take him. But Olaf slept in my recliner yesterday evening, and he had the heating pad working along with the pain pills, and he felt much his normal self when he awoke. Long Suffering Spouse and I could hear him tromping up and down the stairs this morning shortly after 5:00 a.m. (he has to be at work by 6:00) and we could literally hear that he was greatly improved. But we figure he'll crash at some point today -- and we'd prefer he not be behind the wheel of a car when it happens. There are times when I think if we didn't have stress in our lives we wouldn't have anything at all. What I'd like to be more nervous about is Youngest Son. He's in Florida this week for spring training with the rest of the South Janesville College baseball team (as I've renamed his school) hoping to get in games for meaningful innings and impress his coaching staff under game conditions. The team had their first game yesterday -- but he didn't get in. He didn't mind so much -- it's cold in central Florida, he told me, something I knew from watching the MLB network. MLB showed a couple of Phillies-Blue Jays spring training games this weekend, with temperatures around 50 and the wind howling. Long Suffering Spouse and I went to spring training once when Middle Son was in college; I don't see how we'll ever make it during Youngest Son's college career. I feel bad about it -- a lot of team parents did find a way to go -- but I can't possibly afford it. So, for Youngest Son, I have to worry long distance. I could go down the list. Older Daughter is making herself crazy because she wants to be pregnant and it's not happening. One of her best friends from high school, just married last summer, is now on the nest. It's not that Older Daughter's friend was bragging about it. Older Daughter is so highly tuned on this issue that she heard something in her friend's voice on the telephone. She put two and two together and nagged and prodded and eventually dragged the facts from her friend -- Older Daughter thus becoming the first person to find out about that impending blessed event besides the prospective parents and their doctor. Then she cried for 24 hours. Why do that to yourself? Long Suffering Spouse is near tears every time she talks to Older Daughter, and they talk every day, sometimes three and four times a day. And Long Suffering Spouse is herself highly stressed at work. With all that was going on in the house this weekend, she still managed to work 20 or 30 hours on school stuff. The 8th grade boys consider themselves through with school even though it's only March. They've figured out that, thanks to my wife's hard work, they're likely to place out of Spanish I in high school -- and they don't like that, not one little bit. They don't want to be challenged by an honors course; they'd rather get an easy A repeating stuff they (however reluctantly) learned from my wife. So the kids are digging in to prevent this -- I can't help but wonder what their parents would think if they knew. These poor parents will spend $10,000 or $12,000 on high school tuition next year; wouldn't you think they would want their kids to do as much, get as much, know as much as possible before getting there? But I can -- and should -- do a separate post or two about Long Suffering Spouse's school problems. For now, I'll close. I need to check that third party website that interposes itself between me and my one new insurance client and see if they've constructed still another frivolous reason to reject my latest bill. I have one bill pending for about $800 on which I seem to have spent $1,000 worth of time just trying to get past the bogus 'client review' process. So far. Are bars of soap now an endangered species? I had no idea they now sell "body wash" for babies. I know "body washes" are increasingly popular for men and women. I don't understand why. What's the matter with plain old soap? Here is the power of advertising on overdrive: The young people have been seduced into believing that shampoo is better than soap. It certainly is more expensive. Remember when no self-respecting male would wear perfume? English Leather made a bid for the market in the 1960s with the tag line, delivered by a voluptuous blonde -- 'all my men wear English Leather, or they don't wear anything at all.' It didn't really work: This appeared to be an either-or choice -- and most men watching would have gladly chosen the latter over the former. Meanwhile, the woman in question, for obvious economic reasons, preferred the former over the latter. This created conflict. But in recent years, a truly stinky product called Axe has made obscene profits by running nearly obscene commercials, showing women who can't help but tear at the clothes of any male daring enough to put the product on. (See the difference? Men use the product and then they still get to wear nothing at all in the company of similarly inclined women. Conflict resolved: Win-win.) The product certainly made an impression on my muy macho, athletic sons. They'd go out on a Saturday evening so thoroughly doused in the stuff that they left clouds of opaque vapor behind them. It made the once-celebrated L.A. smog look transparent by comparison. I'd tell the kids that they could knock a buzzard off a sh*twagon with that stink, and they'd just favor me with a patronizing look -- you know, the look that says, you're old, Dad, but you're amusing in your antique way. Eyes watering, gagging on the stench, I'd try to tell them not to stay out too late. Who knows? Maybe the girls watched the same commercials and thought that was how they were supposed to behave. Maybe tearing off the boy's clothes would help dissipate the odor.... In order to find out whether this might be the case, I suppose I might have tried the spray -- at least once -- if I was their age (in a sense of strictly scientific inquiry, you understand). But what's the attraction of "body wash" over bar soap? It leaves the bathtub slippery and seems to slow the drain. All that residue on the porcelain and in the plumbing suggests that plenty would be left on the skin as well. Why would anyone use a product that costs more than soap but doesn't get one as clean? I'd ask my granddaughter why she's using the 'head to toe' baby wash, but she doesn't talk yet. But she will eventually. And who knows what products she will demand of her parents then? From Real Life Adventures, by Gary Wise and Lance Aldrich. March 1 is allegedly the first day of meteorological spring. You wouldn't know it by the weather in Chicago. Spring officially begins later this month. Bold and fearless prediction? You won't know it by the weather in Chicago. Regarding the recent developments in Rome: From a certain point of view, can't one say that Benedict XVI gave up the papacy for Lent? Why are you grousing, then, about cutting back on chocolate?